--Henry David Thoreau. For earlier mentions of that scruffy-faced 19th-century transcendentalist poet with a hankering for secluded ponds, go here, here, here and here. Years ago, I asked someone if he had any regrets and he said: "there are always regrets." I think he was right but regrets can torture or make you wiser. What about you? Any regrets? Of course, Daniella. He who hasn't any regrets hasn't lived. But as you suggest, it's how you choose to interpret them that's really the more important element. Like everything else, we can look at the glass half full or half empty when it comes to natural regrets over roads not taken or perhaps roads that were taken. And I'll be happy to share some of my personal regrets with you one on one, over a cocktail or coffee, since I've been trying to schedule time with you, dear old friend, seemingly forever. "Regrets, I've had a few;"
Yes, Lou, that same song also came immediately to my mind when Daniella posed that question. But I'm afraid Sinatra's regrets were probably far too X-rated to be explored here. 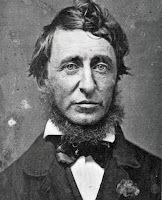 I regret never having had the guts to grow a truly awesome neck beard like Thoreau's. You'd surely stand out in the 21st century. Thanks for visiting, though. We will have a great conversation and discuss regrets, I promise. Have a wonderful holiday week-end. I'll be looking forward to it, Daniella.